MacLeary discusses his role as Prince Siegfried in Swan Lake. MacLeary was born in Glasgow in 1937. He began his training with Sheila Ross in Inverness shortly before he entered Sadler’s Wells Ballet School and joined Sadler’s Wells Theatre Ballet in 1954. He created roles for Kenneth MacMillan in Danses Concertantes, The Burrow, and Le Baiser de la Fée. Following a performance of Swan Lake with Svetlana Beriosova, who would become his longtime partner, he was promoted to principal and transferred to the Royal Ballet at Covent Garden. He retired in 1975 and remained with the Royal Ballet as ballet master and later became réptitéur to the principal artists of the Royal Ballet. As a dancer he was known for his strong finesse and natural romanticism. 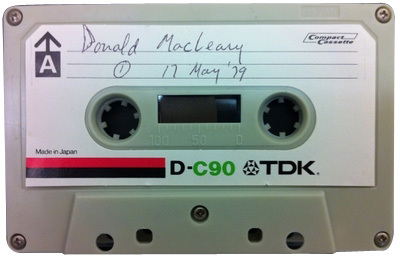 “Donald MacLeary (published 1982),” Dance Dialogues: Interviews by Barbara Newman, 1979-Present, accessed April 25, 2019, http://dancedialogues.prattsils.org/items/show/40.